I have out-sneaked myself with these gorgeous and sweetly spiced Sneaky Spiced Pumpkin Baked Doughnuts. I am pretty chuffed with my cunning in creating so-good-you-can’t-stop-eating-them doughnuts that also hide no less than three vegetables. I am writing this post holed up in bed feeling none too hunky-dory. I fear my ailment is one of two things and neither appeals. Either a. I have picked up the grotty little bug we nursed the elf through last weekend which means we may all fall in the war against playgroup germs. Or b. and I dare not dwell on the thought, I ate too many of these sneaky spiced pumpkin baked doughnuts over the testing period. In the last three days I have made six batches of these beauties and while I gave many away, the doughnuts were made to be tested. And test them we did. I am pleased to say these beautiful little spiced pumpkin lovelies passed with flying colours. I first tried a pumpkin spiced doughnut at Starbucks in the States many years ago and being a pumpkin spice addict, I was hooked. I am surprised it took me this long to conjure a recipe but in-between all the brownies and sweet things I got deliciously sidetracked. Happily that road has led me here to Sneaky Spiced Pumpkin Baked Doughnuts-ville. I wanted to create a recipe that was not only perfect spiced pumpkin joy but was as close to good for you as I could get. Sneaky spiced pumpkin baked doughnuts are baked not fried – the name might have been the tipoff – and are made with spelt flour and un-processed sugar. I used half a cup of rapadura sugar but the batter makes 14 mini doughnuts, so…not so bad. Also, there is no butter, only two spoons of vegetable oil. Finally, sneaky spiced pumpkin baked doughnuts contain, as you can imagine, pumpkin but also sweet potato and carrot too. Phew. I don’t know what witchcraft occurred in the oven but adding vegetables, raw and grated, to the batter gave the resulting doughnuts such a wonderful texture. These little guys are light but dense enough to hold on to the sweet pumpkin spice flavour I was after. Each bite, and I should know I had many, is a balance of sweet maple glaze and crushed pumpkin seeds and perfect pumpkin, brown sugar, nutmeg and cinnamon goodness. These doughnuts are bloody good. You know what, I am going to call it. If I made myself sick eating too many sneaky spiced pumpkin baked doughnuts I can’t wait to do it again. These little lovelies, whether dressed in crushed seeds or simply tossed through cinnamon sugar are totally worth the bed rest. 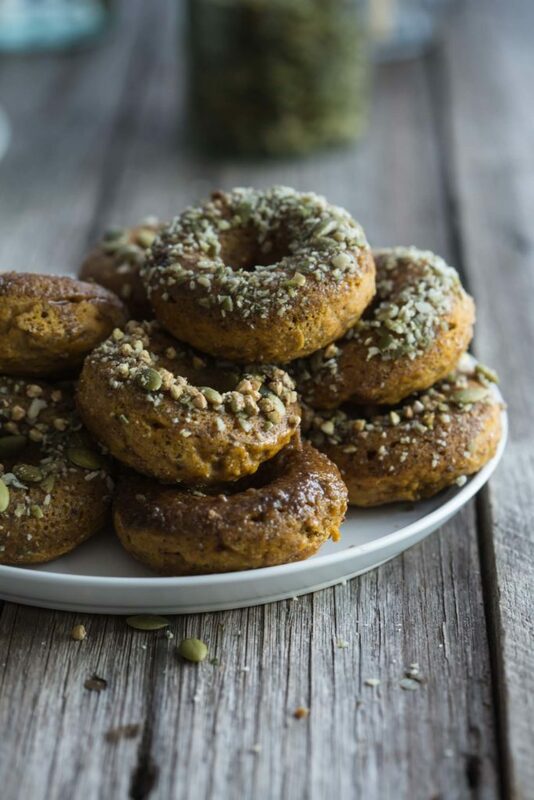 Sneaky Spiced Pumpkin Baked Doughnuts are so-good-you-can't-stop-eating-them vegan doughnuts that hide no less than three vegetables. They'll never know. Lightly grease a 12 mould mini-dougnut pan. Put the vegetables, almond/soy milk, vanilla and vegetable oil in a blender and blend until smooth. Sift the flour, baking powder, baking soda, cinnamon and nutmeg together in to a large bowl. Add the sugar, salt and flaxseed powder and stir to combine. Add the wet mixture to the dry and fold to combine. Spoon the mixture in to a piping bag or ziplock sandwich bag, snip a corner, and pipe evenly in to the donut moulds. Combine the glaze almond milk and maple syrup in a small saucepan and heat to a simmer. Continue for 5 minutes before removing from heat and setting aside to cool. 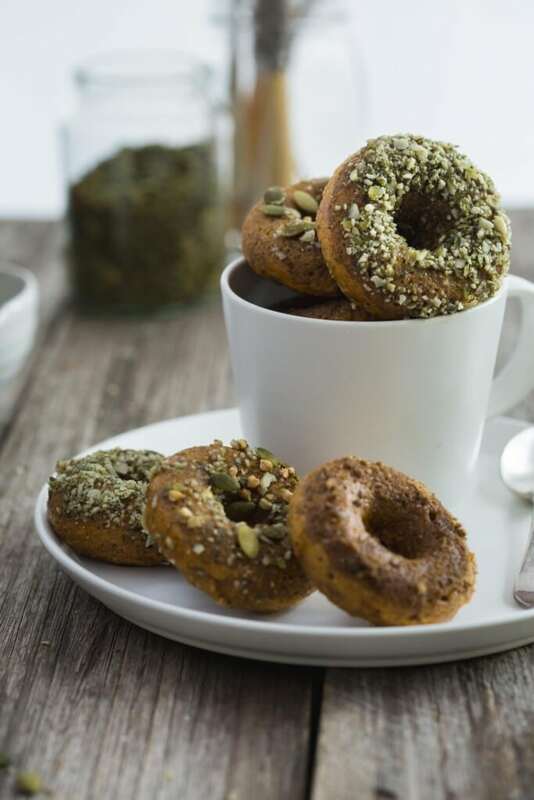 Dip one side of each donut into the glaze before either sprinkling with crushed pepitas or the sugar cinnamon mix - or both! Different spelt varieties can vary. If you feel your mixture is a little dry add another tablespoon of dairy-free milk. The Batter is super thick but still moist. Such pretty doughnuts! Beautiful photos too! Thanks so much Stephanie. They are a favourite in our house right now.